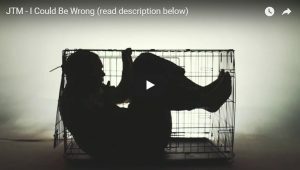 JTM (the LDS musician formerly known as James the Mormon) has released the music video “I Could Be Wrong” about being abused physically and emotionally almost daily. “The first 17 years of my life were Hell… The most scarring events were me as an 11 yr-old, being beaten with a two by four to the point where I couldn’t move. All I could do was cry & wonder what parts of my body were broken. “The second was being stripped down to my underwear and being locked in a dog kennel along with my younger brother for hours. I haven’t spoken to my parents in years, & because I have no plans to speak with them, I wrote “I Could Be Wrong”. This song & video illustrate a hypothetical conversation between them and myself where they finally tell me they’re sorry. In this video I play both of my parents and myself.